If you would invest 14,516 in Apple Inc on June 14, 2017 and sell it today you would earn a total of 261.00 from holding Apple Inc or generate 1.8% return on investment over 30 days. Apple Inc is currently generating 0.0903% of daily expected returns and assumes 1.0712% risk (volatility on return distribution) over the 30 days horizon. [Therefore], 10% of equities are less volatile than Apple Inc and 98% of traded equity instruments are projected to make higher returns than the company over the 30 days investment horizon. AAPL has moved 4.39% or $6.27 in 7 days. Remember 98% of correlated equities are projected to make higher returns. TAKE AWAY: Consider the possibility of a reversal prior to release of the iPhone 8 – hype factor. Piotroski is a 7 – Strong so maintaining a long term investment in the stock is viable. Scalp a Long Put/Short Call trade starting next week July 17.2017 – 10 days before earnings are released. About R. Kambak: A freelance market for Macroaxis Research Hub. 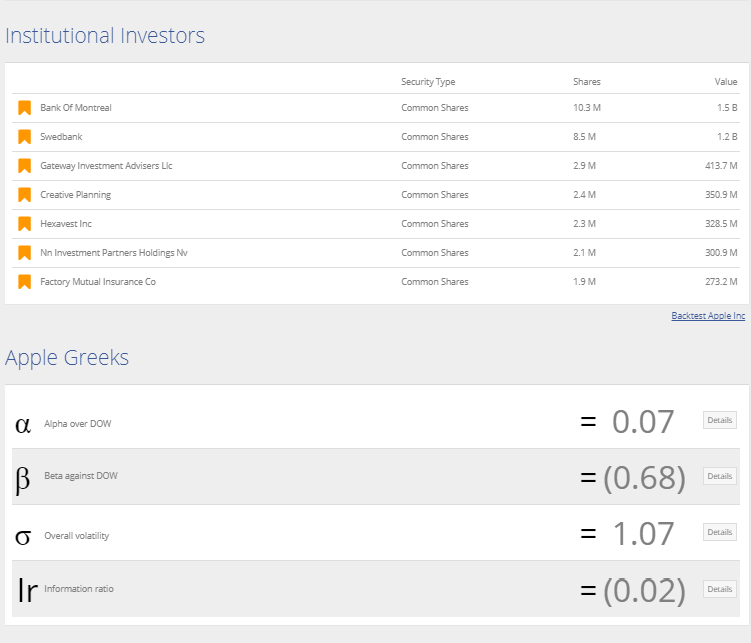 Has provided quantitative input for various option platforms as well as a beta tester for Tom Sosnoff – Tastytrade/Tastyworks. Mr Kambak has accumulated twenty years experience as a Forex, Commodities, Equities, and Options trader. Interested in the CXQ Excel Model please send an email to: grtsmarket@gmail.com. In the Subject: CXQ Request. The TOS charts and Macroaxis Research Hub graphics and copy are provided by attributed permission. All MSN Excel spreadsheet posts are solely Mr Kambak’s own creation. Attribution-NonCommercial-NoDerivs CC BY-NC-ND Duplication is strictly prohibited without attribution. When I read Paul Ford’s What Is CODE – recently published in Bloomberg, it resonated with me enough to be inspired in writing just as abstract flash fiction blogs regarding our world of a Turing Machine based binary code, the influences of Apple’s “App Stores” flooding our ultra-mobile high tech market, which amplify the threats that are infiltrating the security of our financial institutions, and the means of which, devising an alternative trading platform that is completely coded unlike anything before, stands out as the priority in my life right now. Is the threat worse or the massive proliferation of ultra-mobile technology dominating our lives and credit cards? Ford claims there are an aggregate collection of coders (programmers) around 18 million and growing fast. He makes a poignant point that you cannot disregard (and I’ve known for a long time after having my computer’s hard drive hacked to death several times) that either programmers are running the world or the programs that they are coding are running the world. If you stumble upon my blog and read the accounts of this fictionalized – flash written story – you’ll be introduced, rather covertly to the things you NEED to know in regards to developing a vital perspective that challenges your own subconscious bias between myth and fact. Such as that people think Apple is a superior product. It is not. In fact, to date, Apple/Macintosh is a wanna be Android, given that baseline syntax used for all operating systems is Unix/Linux based. The Apple Watch is only the means of which to keep its customer base tethered to having to have their other products to find satisfaction of functionality. Blindly spending more money on something that is inferior reeks of the irrational behavior of a “skewed” debt driven economy that make Bitcoin more attractive each day we face another economic crisis. Have you bought a Mycelium Wallet yet? You can Ubuntu-ize your life to make it much easier to manage the “terminal codes” of which both Microsoft and Apple are terminally ill because the collective “they” programmers, are like all writers of anything – Asemic to Linguistic Tongues – they have to put their own spin on it, plagiarizing that which was the original Basic Word. Moreover, he Proof of Concept trading model: CODEXCELIAN can give you the robust absolute critical knowledge of understanding equity mechanisms. 2 + 2 = 4.
Notable physicist Roger Penrose pays the deepest respect to Alan Turing in his white paper on living a computer driven lifestyle. It is without a doubt a truth of which sadly one of the greatest minds of the 20th century was destroyed by homophobic zealots. But then there is Ada Lovelace, Linda B. (UNIX coder) and others who pioneered the course of technology to what we know of it as managing, or at the very least obstructing through complications of Blue Screens of Death in our lives today. We live in a world economy based on the Pareto Effect. Our very own perception and/or motivation to claim our individual right to be selfish enough that it is the way to attain our construed dreams of fulfillment, are guided and molded into this belief system that for one to gain, another must suffer. This title reflect it, metaphorically, because story titles are suppose to emblematic of the story’s plot, and my story embraces humanity because I am a human, at least I was mere reflection of one the last time I looked in the mirror. “Write Him Off” is to imply that the Turing’s Model no longer works, Wolfram, et al are in danger of becoming extinct, just as millions of earthly creatures have disappeared from our wanton gluttony of devouring the earth’s cyclic equilibrium of resources, thrusting our civilization into a quick descent of obscurity. I mean no insult to Turing, yet it does bear fruit in the manner that he was initially mistreated and then through the course of computerizing society’s history our coders are evolving his mechanism. “Z Equals Zero” equates into the Greek letter “Zeta”, (you already know what this represents) and Zero as the numerical binary code “0” that streamed down the computer monitors in the movie the Matrix – representing a Zen mindset of “the illusion of nothingness”. Combined together you have a story plot about the ending of one computerized mindset era and the its code. Then there is the nonfictional aspect of my quantitative model (hint for you coders) that is ready to be programmed for API cloud access, is going to be posted here. Had you read my article “SERGM” last year, you’d been introduced to a manner of critical thinking that, to my surprised gained me an invitation to join Interactive Brokers “think tank” on writing trading algorithms. I declined because of the very fact that I would have been pushed into the traditional mainstream polluting belief systems (our synapses transfer data between neurotransmitters at 2 milliseconds, much too slow for CPU programmed high frequency trading programs – clocked at 2 microseconds) of which I am trying to break away from by listening to frequency tones on a daily basis. Pineal gland activation is a primary function of exiting the Occidental paradigm. Your own thought process right now is getting jumbled, as the presentation of my own stream of consciousness is skewing the internal perceptions of your limited time frame experiences in life as not equating – both mathematically and psychologically coherent. We, as humans, can only evolve as fast as our minds can assimilate what we experience – and that comes in holographic fragmented fractal tiles of embedded memory – stored in at least three areas of our cranial machine. Artificial Intelligence is seriously hampered by this fact as our own mental latency is transferred into the construction of a machine that is mathematically programmed to our cognitive means of critical thinking – running wildly through mega calculations that spin terabite hard drives out of control. When the algo hits a snag, it halts and goes into the BSOD. There more inefficiencies within our computer industry than there are common nonsensical approaches to solving the issues that we have already created with due course of conflict resolution. This opacity causes risks. One study by a researcher at the University of Hawaii found that 88 percent of spreadsheets contain errors. Paul Ford, What Is Coding? I’m taking you into “no man’s land” per se – and this part of it will take a quantum leap of faith on your part to try and remain connected, and focused with impeccable intention – the journey of Don Juan in Carlos Castaneda, and beyond the mouse pointing cursory browsing attention span of three seconds. In conjunction to this blog site – I’ll be developing a website and YouTube videos that hopefully, once I get the “bugs” fixed will be live Excel streaming (making sure I’ve removed the 88 errors) so you can follow my gleamed equity and option trading signals. It is my intent to introduce you to the future of trading platforms – both through fictional story telling and the actual reality of Lilliputian mechanisms based on abstract constructs, i.e. quasicrystal polyhedral geometrical strategic complex systems embedded with adaptive agent subroutine calibrations that reveal the “pings” of HFT’s shark bait offers. Be aware that things will be getting “thick” to make you “think” in solving what I will be making more puzzling by not filling in all tilling along the way That’s your job to exercise your gray matter between your ears. Finally, I am NOT the guy in the khaki jacket. Stay tuned, the best is yet to come. I might even get a Noble Prize. SYNOPSIS: The Codexcelian Exchange crosses at the intersection of “CODE” and “EXCEL”. The Euclidean coordinates initially written down on “patches” eventually morphed when the patch manifolds were plugged into the Darwinian Blackbox. The FORX defined a new procedure for us to capture the equation of the true self, thus freeing our lives from the Indiscernible Matrix. The following summation is all that is left from the extraordinarily eye opening awareness in regards to the advancement of technological micro-device development, based on what is known as the “SPREADSHEET”. DEF TARCIAN advanced the evolution of the Excel Spreadsheet with what he termed the Codexcelian Model. The manifesto explaining the Codexcelian Model was banned for distribution by the newly formed CARNELIAN SURVEILLANCE OF THE INTERNET OF THINGS in 2016, government sub-group to the Central Intelligence Agency, that wasn’t required to be disclosed of its existence to Congress or the American people. Def Tarcian was a leader in “outsourcing” and “open sourcing” code at the end of the 20th century, up until his disappearance two years ago. A genius of technology, in his own right, a Nobel Prize recipient was one of the first programmers of Unix in the mid 1980s. At the time of his disappearance he had been aggressively distributing Raspberry Pi motherboard “packets” that had been programmed with the Codexcelian Model. The Essential USB Encrypted Turing Lock came with the unit. Tarcian, a loner, who lived like a hermit, must have gotten lost while hiking along one of the treacherous mountain trails. It was known that at the time of year, extremely fierce storms could materialize within minutes – bringing a torrential rain or snow storm. His body has never been found. His cabin has since been raided by local youth, having broken in, obviously trashing the cabin’s spartan furnishings and burning most of Tarcian’s research papers in the wood stove. The local sheriff closed the case after two months of investigating and searching for Tarcian. The Federal Bureau of Investigation and Homeland Security were reported to have visited the area during the search. LYONIZATION: The phenomenon in which heterozygous females do not phenotypically express their X-linked recessive genotype or do so only randomly. Also called X-inactivation . But if there is X-Activation, it would be extremely important to humanity at this space-time continuum, dissipating any resemblance of global maximum indecernability of the true self. Def called it the Lyonization Factor; a breakthrough for us to access the Worm Hole: activated by the Planck spreadsheet equated code – when plugged into any PC or tablet: where upon the molecular structure of human form would be cosmically transported one bit per qubit; freedom to access teleportation into the universe. This revolutionary leap needed to be distributed globally, so a digital algorithm syntax was devised by Def Tarcian. Tarcian, one or our greatest astrophysicists, found the equation sequence between the Fibonacci Ratio and the “prime number sequence” which was encrypted into the CPU of anyone’s computer. “Here lies the ambitious juncture – in harmonic resonance with human perception and universal reality” imprinted on each of our DNA. Mutation of our species with each off spring is the chance we take, Tarcian wrote, where the measure of certainty collides with irrationality of human generated thought forms and/or deformed. Thus how would we identify the lower operative “randomizer”? All human behavior, Tarcian stated, is simply built upon Four Manifolds; which brings equilibrium to our global infrastructure of “economic free will”. Evolution rejects any life form that is not in harmony with the Four Manifold Frequencies. There is cognitive dissonance at levels far below the individual awareness to see their “in play” interaction as an “Agent” of eliminating the connection between the conscious and subconscious holistic value. “We are all connected telepathically on the same earth frequency; collective neurological transceiver at birth. By age 5, our Limbic System has matured to the point where it will use hormones and neurotransmitters to evolve into a transmitting receiver. ransmitted constantly by our DNA coding in conjunction to cellular mitochondria. Neural entrophy prevails as the law of nature: time decay is our mental Black Hole. The necessity of survival isn’t about survival, for we’ve been given the gift of immortality if we so choose to live with its coordinates as real ownership of our lives. But time evolution mimics, with fairly good accuracy, the accumulation of our past memories, stored within our cerebral lobes; activated or triggered to be recalled and projected upon our present moment, just like a movie projector does on a movie screen. Television is a rerun of our past. There exists four heterozygous forms that have been built into the computers CPU. These are sociological, teleological, ethological, speleological. While the “Elite” continue to survey us, making sure the “media” optic matrix keeps us imprisoned by short circuiting our ability to discern our true identify from the false one. The phenomenon in which heterozygous females do not phenotypically express their X-linked recessive genotype or do so only randomly. Also called X-inactivation . We prefer to loop through life; habitual repetition of our species is not that of the strongest, Conners argued, but that who allows themselves to become a conduit of the higher enlightened True Self. We essentially mastered impeccable intuitive intentions as the necessity for indeterminate future violations propagated by “Black Holes”.intelligent among us as natural selection for procreation. By picking an essentially biometric using the Plank length of 10-33 cm. The junction topologies are initiated by Bid/Ask ticket stamping Jobbers when a Turing binary input is sent from a PC/Mac/Ubuntu Retailer who has capitalized their membership with in one of 13 Exchange routes (EXCH-RTE). This Euclidean coordinate challenged us to find the means of producing a highly efficient platform adaptive finite procedure – the navigational charts of economic assets – uses the overlay of Fibonacci Ratios. All equations to date globally in-sync with the “Fib” the domain of which no one has been able to pinpoint the origin of the universe’s mathematical sequence that leads us into infinity. Spikes, as oral myths are known to be born, was venturing into formulary equations; efficient frontier horizon with the asset (underlying) and option (derivative) in which the criterion of both “entities” merge four manifolds in a coordinate adaptive computational system. We speak in terms of using the computer to carry the heavy load of calculating complex formulas, almost instantaneously, that meet the four manifolds of which are logically determinism. Tale of VisiCalc to Lotus 1-2-3; HELLO WORLD development is quickly demanding statistical quantitative logic configurations when it comes to using signal based scoring for Bid/Ask entry and exit – achieving 80% profitability. Codexcelian comprises of the archetypal calibrations, formulas, workbooks, spreadsheets, templates; the overall DNA origin that is an adaptive complex computational software. VisiCalc calibrated into the encoded, syntax formulations masterfully programmed into Excel. From Lotus extraordinaire cellular adaptive computative model, makes for a robust Options tactical risk averse investment. Lotus 1-2-3 still holds the largest market share in calculating spreadsheet software. In a “zero-sum” gamification model, the flip of the coin prevails: a 50/50 change that makes your investment transaction of marginal 40% winner. Professional market traders are consistently hitting 80% or more. Why? We will get back to those in more detail later, however, it is a matter of introducing you gradually so as not to deter your memory bias reactions – that show up after you’ve lost money. Solution? There are many approaches to describing the Elephant in the Room. So we must introduce an “impartial judge”, just as with cinema acting – the camera never lies (unless you’re fidgeting with your Smart-iPhone editing app). Codexcelian is a term used that defines our incorporation of Excel to the Ancient Archetypes that knew the Secrets of the Source through the five basic geometrical polygons. 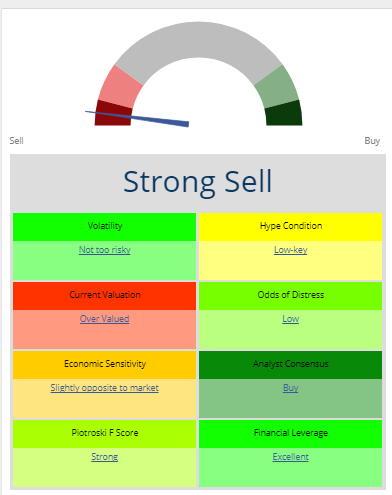 Cut to the chase: Presented is an Excel template that provides you with the asset snapshot’s relationship with the market indexes, the asset price range, and the ultimate signal based scoring metaphor, according to Einstein. Models are metaphors. Metaphors are our catalyst to inform morphing expansion into the Quantum Realm of our Natural Existence. Mathematics is our universal language. All life is based on economics; production, distribution and consumption of goods and services. Our behavior,collectively is irrational. Why? Because we fudge, lie, cheat, as the means to maintain the “falsity” of a recreational rational mainstream of “what ought to be”in the marketplace environment. We are linguistically oriented in our Blackbox subconsciousness – “rules of the house”. Economics revolves around Lambda Calculus. Fundamentally the “derivative” is a value dependent variable determined by the quantity of an independent variable. When trading options you enter into a time dependent velocity that is in constant decay. That “decay” exists as a slope; a linear approximation of the input values. We evolved from a holistic perception of life to a dualistic void. We misunderstand the necessity of Yin and Yang, unaware of the missing input value: The Lost Zooma. Morphing our brainwave entrainment intelligence through technological devices that connect the invisible hand of commerce links more of our biometrix awareness within our ethos- psyche to others, to which we have yet to realize. WHY ALL THIS MUMBLE JUMBLE? Trading Options, whether you agree or not, is a Defeasible Function dependent on one quantify function determined by an independent variable. he Derivative Abstractions: Asset Allocation. Fancy high brow terms cause conjunction within our individual separation of 6%; these categorical distinctions depicting the diversification of the Fibonacci Ratio Overlays on the Japanese Rice Counting Market Exchange Candlestick Chart, respectively. Spank the Monkey with Monkey Charts. , Combine Monkey Charts with Volume/Velocity Butterflies, flittering about the space-time continuum. Matrix Explained: From the top we input the major indexes to track overall market performance. (Dark Blue Banner) Then we input the asset price range, using these specific array inputs for part of the CODEX trade signal, just below the price range on the left side. The C-RTN is our covered return reduced cost basis calculation that of which the meat of it is not shown here and will take another session to explain it’s father unique adaptive features. For Options we’ve decided to focus on Strangles, solely, after gathering a years worth of empirical data comparing Strangles, Straddles and Verticals, though the Excelian Option Template has the flexibility for user preference. The standard formula is to buy a Call and buy a Put – one to two legs out from the current correlative strike price to asset transaction price. We whittled down the most pertinent inputs for this matrix that gives us the most robust outcome. These are in the order of Strike Price, Bid/Ask Premium, Delta, Implied Volatility, Probability of OTM, and Volume. We are using “Thinkorswim” to obtain our real-time streaming data. To set up our Options spreadsheet, we have a second workbook where we paste in the Option chain we have chosen, from the Trade Tab, using 8 Strikes. Our inputs are correlated to the above inputs, of which we cut and paste into the respective cells. This can be set up automatically, but the Option chain layouts aren’t all the same so having a single template can skew your numbers for another asset class. Contracts are listed in the hundredths and then you’ll see the final calculations for cost per CALL/PUT capitalization, sum total, and then Profit/Loss individually and then consummated – at the bottom in Red. The Codexcelian also calculates the limit and/or best price for market entry for both CALL and PUT entries, based on Time Decay. We have broken this down into three periods – using a 30 day time frame. 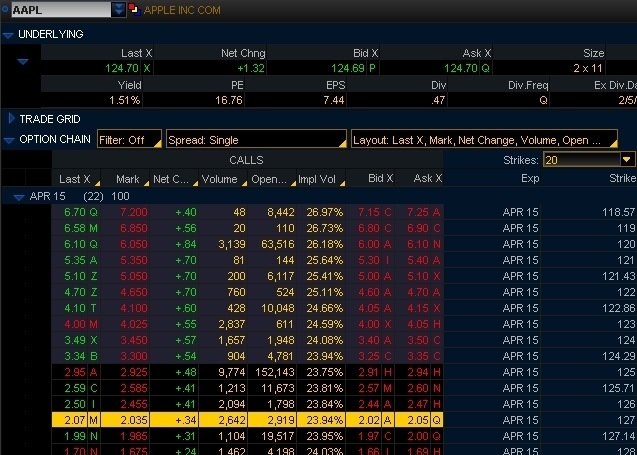 As you can see, the CALL and PUT “Limit Entry” correlates to the Entry input in the Option Matrix spreadsheet. This is automatically calculated, so one can automate this spreadsheet into an algorithmic trading program. Note that the 30 days and 60 days are configured in this particular instance given the March option chain. You can see what your entry price will be going out 30 days and 60 days, or at time of expiration. However, this will change dramatically during the time that you hold your position, specifically when committing to earnings transactions. We use a 1/16th divisor formula to find best price entry. You can see that from the time we entered this trade, the Long Call profited more than the Long Put. So, what everyone really wants to know is if they are going to lose money or make a profit by transacting a Strangle. The answer is either way – as the time frame selected will give you either a “squeezed” play of volatility with less than 7 days left to expiration, or 60+ days on the “back month” for more flexibility to “roll out” either the Call or Put if there is a significant deficit. We call this a “non-zero sum” gamification model, because the premise is for the investor to have the greatest edge, or probability of profit, in a win/win (Call/Put) set up. Absolutely brilliant. There is so much more to show you, especially our model that tackles the Dark Pool/High Frequency Trade “gap” ups/downs. The caveat for retail traders is to accept the fact that the traditional indicators don’t work in an 80% dominated automated, computerized algorithmic trading market. Even if you think it’s a “machine to machine” solution, it’s not and I can back this up with another thesis at another time. I do encourage you to build this layout and/or contact me directly for obtaining a template. Full disclosure is that this presentation is for educational purposes and for the advancement of retail trading modeling. Total transparency. The key is that the Codexcelian spreadsheets will entrain your bias cognitive means of decision making that is predominately unconscious habits. We all need a little reassurance in the beginning to know our hypothesis is right. The CODEX Logic Score attains just that. For your assistance, all cells with complex formulas have call outs that will explain, teach and remind you of it’s robust use with in the network of nodal inputs. I encourage developers and programmers to consider taking this to the next step in building an algorithmic software. We would love to put it on a Raspberry Pi or similar micro MOBO, pre-programed to minimize latency for retail traders and have an integrated cloud updating link. CODEXCELIAN QUALIFIES WITH THE HIGHEST MEASURE OF CERTAINTY FOR THE FOUR MANIFOLD ALGORITHMS: 1) MSN EXCEL, 2) APACHE OPEN OFFICE, 3) GOOGLE FINANCE SPREADSHEET AND 4) UBUNTU DEBIAN LIBRE CALC. Introducing our move toward a “block” “chain” model using Excel for baseline configuration of input/output parameters regarding Option Trading. 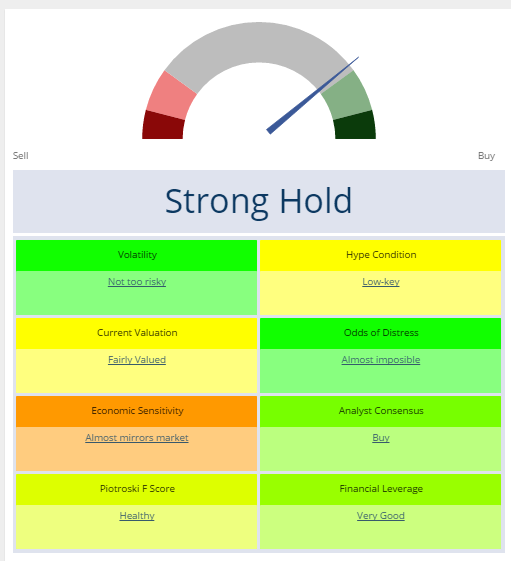 Taking into account the opportunity to make profits from the earnings volatility, we review out context for the pre-earnings report for the asset Adobe (NASDAQ: ADBE). CODEX/C-RTN BLOCK: This is a signal based calculation that takes into account both underlying price ranges and statistical computations. It is sensitive to price move, just as Beta, even more so, and provides a Forward-Looking outcome. When CODEX is positive than the underlying price trend is Bullish. When it moves into the negative, the underlying price trend is Bearish. The max number either way is +1.000 or -1.000. C-RTN represents a modification of monetized cyclic period to determine the trend, and a calibrated signal “BUY” that is based on a Logic formula. When the Codex and C-RTN are in conflict, meaning they don’t complement either positive or negative outputs, than there is a risk averse alert for entry. The CALL/PUT “BLOCK” aligns the correlated data inputs provided to track the variances between elements. The Excel layout is flexible so that the elements can be arranged in accordance to the option trader’s hypothesis. We use “Thinkorswim” to export the selected option chain(s) that is pasted into adjacent spreadsheet. Then the relevant data is cut and pasted into this format. What is not shown is the DTE (Time Decay) entry price BLOCK that provides the “limit” order price in relationship to the traders spread. You’ll notice the Entry Price input where, in this case, we went Out-of-the-Money (OTM) for both Long Call/Put. Typically, we prefer a comparable premium, yet our strategy for this trade was short term, capitalizing on volatility and time decay. BLOCK ARCHITECTURE for this layout is meant to be an optical reference; both for mental entrainment by seeing the correlation of the underlying price move to the Options inputs, and providing an orientation to see time decay of the premiums in real time. Our terminology has changed over many times over the years. Conceptually, it’s basically all the same: building a node of dependent statistical input data that is available to be “chained” or “linked” or “neural” to other “clustered” independent data that is incorporated into various Excel formulas. We like the flexibility of using Excel as it gives us many options for simulating outcomes and most importantly Proof of Concept. This ledger publication is extremely simplified in presentation. As we present more of our own trades and the context behind them, things will become sophisticated and in-depth. 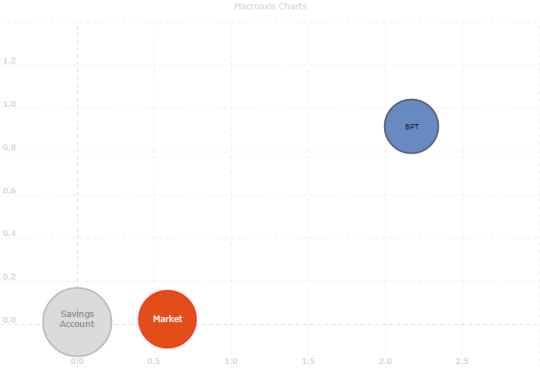 Macroaxis Financial Analytics provides a complete breakdown of relative analytical elements used by portfolio managers. We use Macroaxis for several reasons; in this case we wanted to see what the overall market sentiment was for Adobe prior to their earnings release. We’ll incorporate this feedback into making a case for leaning into either the Call or Put. GRTS Market Analysis and Codexquant are meant to present educational thesis’ to provide insightful means of attaining impartial investing decisions. The take away, moreover is an orientation to confront “our” bias and blind spots when it comes to the truth. Traditional means are quickly being replaced by highly advanced technological devices and programs. If we can provide one with a new insight of what’s valid in revising the way we assess our global economy, than we’ve achieved our purpose. Forex Dealing Break Down (1) Click on the link to you to open the “pdf” graphic of trade execution flow exchange comparisons between retail traders and High Frequency Trading algorithmic “machine-to-machine” trade executions. How Slow is the NBBO? Thirty percent of Wall Street’s intraday liquidity is transformed through price formation acceleration, explicitly influenced by high frequency trading thriving in millions of dollars of profits by exploiting the exchange’s trade execution “latency” electronically sent over the Internet ot capture the “best price” trade executions for the consumer trader. To be efficiently profitable as a predator on incoming bid/ask trades, the HFT servers are set up is co-located server near an exchange/electronic communications network premise and plugged into a ultra-fast bandwidth. Through network stacking, messaging protocols and raw market data processing. Though the financial media claims HFT brings greater “liquidity” to the market, in reality it is causing price dislocation for the consumer day trader. For example, the NP-Hard can be used as source code applied to the arbitrage decision problem presented by the variance of the bid and ask spread among the exchanges data flows. Here is where the “investors” and “brokers” can virtually integrate the exchanges through their computational technology without “transparency” to the consumer trader. Likening the linear exchanges to a convex polyhedral geometric, the functional aspect of the HFT algorithm parameter compilers are encoded into proprietary computational complexity that solves the “problem” through polynomial time within the concrete semantics of an oracle machine or “black box”. The HFT algorithms must be able to reconfigure frequently in a compute-intensive application to efficiently respond to public data order flows, thus HFT platforms have utilized custom-optimized “field programmable gate array” (FPGA) integrated circuits. Contemporary (FPGA) optimize I/O speed and allow for programmable logic blocks to be wired together. This is key to minimizing data flow through the bandwidth to the exchange. Though time consuming to program these “logic blocks” can be configured to perform complex combination functions. Today, FPGAs are being replaced with an “off-the-shelf” processor (Stretch S5000). Software-configurations based on “clock rate”, such as the Stretch S5000 are an adaptive hybrid of the FPGA. Having software that is configurable within the processor associated with the general-purpose processor (GPPs) and DSPs and application specific processors (ASPs), serving parallelism and flexibility with FPGAs, programmable logic that is completely embedded inside the processor architecture. Moreover, the Stretch S5000’s patented Instruction Set Extension Fabric (ISEF) is a game changer in the world of being able to program a processor for compute-intensive applications. The sky is the limit now for HFT to overcome and exploit exchange trade executions clock time. The “ping” comes from active sonar terminology so named by Mike Muuss in 1983. It is the means of sending a pulse to a target host across the Internet Protocol (IP) network. In consideration of market exchanges, the “ping” represents a “price prob” activated by an application programming interface (API) plugged into a specific market exchange. Consequently, by using the “ping” proprietary data feeds (expensive subscription access) have a tremendous advantage over “public” (consumer) consolidated data feeds in consideration of trade execution latency. Even though The National Best Bid and Offer (NBBO) is meant to “halt” price dislocations (latency), but it has shown otherwise. In light of the highly advanced computational algorithm trading systems such as value weighted average price (VWAP) and weighted average price (TWAP), HFT algorithms maintain an informational advantage by remaining constantly plugged into the major exchanges (listed below) to use latency issues to their advantage. It is no longer the case that the price shown upon trade execution will be the fill price. Maintaining NBBO “best price” is undermined even more are inter-market sweep orders (ISO) and non-transparent dark pools that send a trade execution to multiple exchanges for instantaneous execution, disregarding the “best price” regulation. This is allowed by the SEC. Wall Street has two trading systems. Registered exchanges and alternative trading systems. The exchanges are regulated to provide the “best price” through the consolidated quotation system (CQS), and must file any rule changes with the Security and Exchange Commission(SEC). The electronic communication networks (ECNs) and dark pools, do not provide CQS, but are mandated to match NBBO price quotations. In 2007, the Securities and Exchange Commission established Regulation National Market System (Reg NMS) to protect consumer traders from improprieties of the “best price” execution. Reg NMS requires the exchanges to provide the quotes to the primary exchanges, such as NYSE. Data that is collected under the Security Information Processors (SIPs) for the NYSE and NASDAQ publish the National Best Bid and Offer (NBBO). Consequently, brokerage houses are required by Reg NMS to give consumer traders the best price at execution. Out of the 13 exchanges accessed for market trading, the NASDAQ, NYSE, NYSE ARCA, BATS BZX, Direct Edge EDGX and EDGA have approximately eighty-eight percent of the lion’s share in total volumes. Dark pool trades, that are non-transparent account for more than 12% of the trading volume. For consumer traders, this short duration of dislocation of price, becomes costly in commissions while bolstering optimal profits for HFTs. Empirical data comparison from examination of publicly traded market data and data sold directly from exchanges (tapped by High Frequency Trading algorithms) proves the fact that the “latency” of the consumer’s executed trade is picked off by HFTs, monitoring the data flow with direct access to the exchanges. In one control study between the public NBBO and a synthetic NBBO (Redline Trading Source using a software programmed processor similar to the Stretch S5000) turned up 54,734 price dislocations; tabulated within 6.5 hours of the trading session with the equity Apple (AAPL). It is estimated that price dislocations happened every 2.34 seconds with the latency lasting as long as 1.5 milliseconds. Consumer trades went to the wrong market exchange 0.175% of the time. The average price dislocation was $0.034. The “packet-switched” network measured either “one-way” or “round trip” is being exploited as a “fixed game”. Our new model brand logo is <codex.qbt> of which you’re going to see more of in the future as our signature icon. It is baseline defined as a “code” for programming of which eventually moves from binary code toward a “Qubit” superposition quantum program language. We are using Excel as a baseline platform in determining Proof of Concept of parameters inputs correlated to equations and networking calibrations. We have posted our latest video showing the simple sequencing of data input from the Thinkorswim (TOS) platform into Excel for the Strangles and Straddles template. Click here to view the video on setting up our options template spreadsheet. When it comes to trading “Strangles” or “Straddle” spreads, there few quantifiable “optics” that show a comparison of movement between the Call and Put premiums, calibrated to your “entry price” to give you enough insight to entrain your cognitive decision making towards more profitability. Nor are there calibrated Excel spreadsheets that give you flexibility with defined ranges of which you can “code” yourself though the Open Source format. We developed this spreadsheet template for traders to use in simulating their thesis and/or in executing actual trades to track the profit/loss ratio. It is meant for the novice to have access to an introductory process, so complexity is minimized. The optics reflect to the user just exactly how the choice of strike price is affected comparatively to the underlying assets price move, volatility and option chain month choice. There are so many scenarios with option spreads that it takes time to learn which strategy works best under specific market performance conditions. We are all guilty in trading losses through our stubborn “confirmation bias”‘ so these templates are meant to be “impartial judges” to confront bad default habits and entrain your subconscious mental decision making processes toward refined risk defined knowledge that triggers profitable executions. The <codex.qbt> Excel templates shown in the videos are available per request, and for now, gratis. Please give me some time for turn around as I’m the only one managing this the plethora of requests. In this blog we discuss how we found which option side to lean into prior to Twitter’s (NASDAQ:TWTR) earnings release the following day – 10/27/2015. It never amazes me when the predictable is always the unpredictable when it comes to trading options around earnings. The “zero sum” outcome and randomness of the efficient market indicators are equally reliable to be unreliable. What goes down must come up. And paradoxically, TWTR posted a plus in earnings, though minuscule by our standards, market makers obviously have inventory lined up to short TWTR, proving that our PUT weighed values were correct: but only momentarily since TWTR returned to the breakout price on during intraday trading on 10/28. Posted Table on October 26, 2015 the day before Twitter posted earnings. Estimate is -0.24 cents and actual was 0.10 in After Market Reporting. What transpired as to the volatility of movement provides excellent feedback as to why you’re flying blind, even with statistical evidence to support a “mechanical” risk defined trade. In this table below you’ll see our goal post statistical data indicator’s comparison between the NOV 2015 Call/Put analytic matrix that is calculated by our Codex.qbt* formula. How to read this graph: On both left and right sides we have Call and Put coinciding indicators: Premium (Ask), our entry price (calculated for a limit order entry), Bio premium price, Delta Hedge (not direct Delta, but our own calibration), Gamma, Implied Volatility at the Strike, Probability Out-of-the-Money, Strike, Number of contracts in hundredths, Probability of Profit (calibrated to our own formulary), P/L, and Skew price. Note: Intrinsic is purposely left blank as this is a short term trade. In the middle are the Logic signals: Delta Hedge shows “Call” and Implied Volatility shows “Put”, a contradiction that played out accordingly. The “Spread .03” Alert is to signal us when the spread between the Bid and Ask expands greater than two cents. What sticks out is that the Implied Volatility is .743, well above our .45 threshold for mean reversion of a Buy Call signal; and that the Put indicators out weigh the Calls. With a favorable out come of TWTR going short, we executed a cost reduction limit order with 3 Long Put contracts and 1 Long Call contract, to protect the upside, so not to diminish our profits. You’ll notice we were pretty close in matching up the premiums for pairwise management of risk to reward ratios. Entered around $30.89. Surged up for a Call scalp profit and closed out at closing bell. 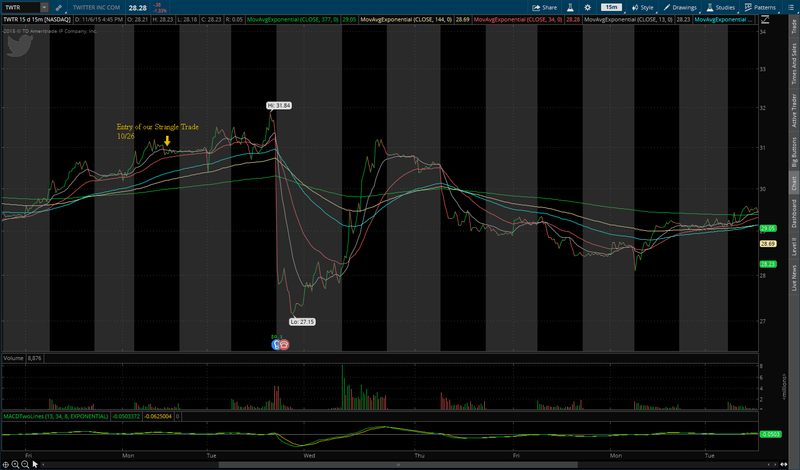 Held the Put side to the opening bell on 10/28 to lock in profits at $28.80. The totals are listed in the above graph: Call profit was $38 on one contract and Put profit was $222 giving us a $260 pay out minus the per contract fees. The whipsaw volatility on price formation was foretold by the OTM percentage. *Codex.qbt is our bootstrapped Excel quantitative statistical model name. It is in the Proof of Concept phase; based on the hypothetical Qubit “superposition” of categorical data inputs compiled into statistical data bins then calibrated for a “measure of certainty” outcome. **Offset is the combined profit/loss between the Call and Put positions. This is an excellent visual for “Strangles” and “Straddles” as you can see how both positions can become profitable at the same time. Do you use TOS? Would you like to have our Open Source Excel spreadsheet models for your own use? Available for MSN Excel 2010, Apache Open Office and Google Spreadsheets. 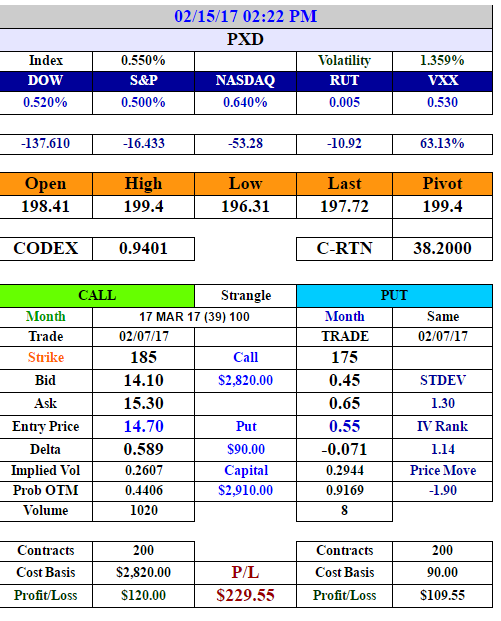 These spreadsheets can be customized for your own trading style and watch list selections. Inquire at: grtsmarket@gmail.com for a list. Disclaimer: The above information is for educational purposes only. We make no claims of validity or suggestion for trading the assets listed. Want to get in on a unique investment? BP Prudhoe Royalty Trust (NYSE: BPT) closed today at $66.40 – up $1.40 (2.15%) for the day with a trading Delta of 1.36%. You’ll notice on the far right that recent drop has bottomed (March 16, 2015) and has started to make the second leg in a “corrective move” signaling a bullish trend upwards to $90.00. BPT is a unique investment tool because you are investing in the “trust” that will eventually deplete your investment (cost basis) but increase your Rate of Return from the dividend payout, thus you can out ahead by the time the “trust” has expired. Please read a more definitive explanation in Investopedia. There are many others that you can explore that can bring substantial returns, though the calibrations between gain and loss is complex. BPT does not have stellar indicators because of past historical ups and downs, but we like the dividend pay out as an “investment” given the back test of 30 days showed 16.97% increase on a hundred share investment. ($5,557 invested made $943 in 30 days.) It just might be ready to start turning things around. Currently the Price Value shows that the Bulls are in control. As “Trust” BPT holds a sustainable future for the short term, so we’re looking at making back a higher yield on our investment against other instruments using the same amount of capital. What it boils down to is what is going to happen to the price of crude oil in a year from now. We expect it to go up. Comparatively, Valero’s (NYSE: VLO) 30 day back test showed a -7.89% loss, with 18.35 million shares shorted. BPT’s number of shares shorted are 1.39 million, with tells us investors are in for the long haul on this one. Exxon (NYSE: XOM) has shorted 42.34 million with a 7 out 100 market performance over the past 30 days. VLO has 0 of 100 in performance. BPT has 27 of 100 performance rating. If you’ve asked yourself what are the headlines going to be 270 days from now, as most financial managers worth their salt do, market turmoil is expected. BPT can ride out the storm with significant outperforming returns. As the world’s first cyber-security we were curious to investigate the PureFunds ISE Cyber Security ETF (NYSEARCA:HACK) that tracks the ISE Cyber Security Index (HXR). Designed to deliver competitive returns, the overall asset classes of 30 securities included in the HACK ETF are approximately two-thirds software and programming and double digit allocation of communication equipment and mobile Internet devices. Internationally, US based cyber-security firms lead at 72% over Israel (12%), Netherlands (5%), South Korea (5%), Japan (4%), Finland (2%), and Canada (1%) according to the Zack Funds report. Clearly, publicly traded cyber-security firms that produce security solutions software against attacks on Internet of Things (IoT) devices are fast becoming highly sought after earners since the governments initiative to be proactive on legislation combating cyber-attacks. Back in February 2014, bolstered by strong earnings and when President Obama pressed for new legislative initiatives to crack down IoT espionage, the “cash on the barrel-head” stock CyberArk Software (NASDAQ:CYBR) skyrocketed. CYBR was already showing an upward trajectory based on their quarterly net income at five times the previous fourth quarter in 2013 of $1.4 million. Then it surged to a 52-week high of $72.48 in February before settling down to establish a new price strata in March around $50 per share. The HACK’S three month performance on Market Value was 12.67%, rising to 15.54% this past month. The top three holdings are Infoblox (NYSE:BLOX); CyberArk Software LTD (NASDAQ:CYBR) with 5.24% in total net assets, Fireeye, Inc. (NYSE:FEYE) with 5.19% and ProofPoint, Inc. (NYSE:PFPT) 5.16% in total net assets. As well, Palo Alto Networks, Inc (NASDAQ:PANW) and Qualys, Inc. (NASDAQ:QLYS). Our volatility generator forecasts a 96.88% probability that HACK will hit $30.00 per share within the next 60 days. Last Friday’s close was $27.84. Right now the price level is position near the 50% Fibonacci Ratio – showing a consolidation that precedes a breakout. On March 26, HACK traded at an unusually high “buy” volume, a signal to us that its going into a 7-day Bullish trend. This gives us confidence that an upward trend is in the making. Listed below are all 30 assets in the HACK and their last “weights” performance (3/27/2015). Source: ISE Cyber Security Index. Taking a lead from the projected increase in global security spending from $71.1 billion (2014) to $76.9 billion in 2015, three more cyber-security firms have announced that they are going public. Collectively, analysts are estimating a $1 billion or higher purchase total. The firms are Rapid 7, LogRhythm and Veracode. As deals flow to upgrade the cyber-security cycle in enterprising innovations coming on the market, coupled with the government’s “bullet train fast track” to take on the offensive against IoTs plaguing American business and individuals, it is predicted that Wall Street traded cyber-security solutions sector’s profitability will be reach 25% or more by the end of this year. PANW.N 4.69 Palo Alto Networks Inc.
Let’s be absolutely clear: The National Best Bid and Offer (NBBO) is meant to protect the retail trader from pricing manipulation by their counter-party that could cheat them out of their profits, while benefiting the brokerage, proprietary dark pools and/or High Frequency Trading driven by their respective algorithms. So I ask: Have you ever experience a “price dislocation”? What I mean is that the price that you executed your exit at was blatantly offset so much – say over five cents – that an elephant could walk through it? Well, you’re not alone. Unless you the means of tracking this, say with an excel spreadsheet that is plugged into a brokerage house platform, you won’t know the origin of the “offset” that cut your calculated profits before closing. Here is the comparison between the Thinkorswim (TOS) platform’s option chain for AAPL (Apple, Inc) premium prices and my Sharebuilder (SB) close price. 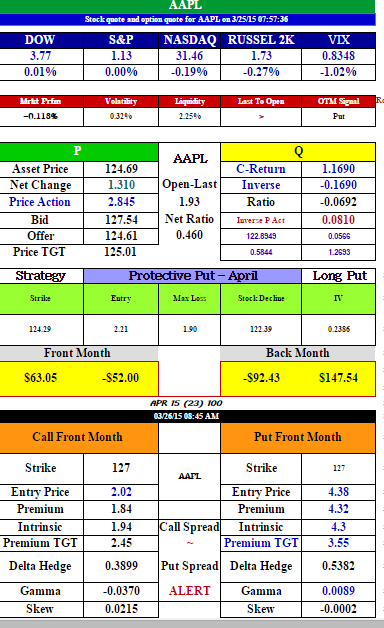 I traded AAPL at the APR option chain, the Strike price was 127.14. My entry as shown below from the SB transaction history was a scaled in 2 contracts per 2 trades with a Long Call position. My target limit was 2.05 on the Ask premium. When 2.05 was hit I executed my close on the SB positions, but was you see, even though there was a drop in the premium on the TOS platform, the SB platform – connected to the BATS exchange – didn’t give me “best price” in accordance to NBBO rules. Above is the SB transaction history. My closing premium for all 4 contracts was 1.93, not anywhere near what the TOS platform was showing at the same Strike price. Just below the yellow highlighted ban is the current premium prices, last price and mark price, which all are well above the 1.93 closing price that SB gave me. My profit loss was over $50 on the four contracts, leaving me with $16 in net profit. Moreover, SB’s real-time price at this Strike price was previously held at 1.86 while the TOS platform’s Call premium price increased dramatically toward 2.05. The lag time on the SB to catch up, and then not even matching “best price” as shown on the TOS platform didn’t exceed 1.96. Whose the culprit behind this? Conniving Leprechauns? Pesky GPU malfunctions? You may be surprised to learn that it boils down to High Frequency Trading algorithms (HFTs) trolling the exchanges for an opportunity to “flash trade” off of your executed trade; either when you open or close. Since HFTs have direct access to contracted co-location to Wall Street exchanges, primarily located in New Jersey, their latency is measured in nanoseconds, whereas yours and mine are measured in milliseconds. Form has two components that determine to be path dependent based on the price range (Bid/Offer) inputs provided by any one of the 13 market exchanges at any one second that eventually shows upon your computer screen. The origin of the asset’s “price” is fundamentally started at the opening of the market session and then sequential accumulation of both Ask and Bid share orders can be calibrated to determine intraday price trends. That means if you set up an excel generator to record any equity Ask and Bid share orders, you can scale out a directional price movement forecast using the appropriate computational statistical mathematics. “a. This defines the weighted side which in turn shows the propensity toward formulating a trend that is either Bullish or Bearish. There are 24,000 seconds during the Wall Street scramble to trade in one day session. Within those 24,000 seconds, High Frequency Trading (machines talking to machines) causes 2.4 price dislocations, most often times cheating retail traders out of a few pennies on the equity’s Bid/Offer spread, including option’s premiums. That comes out to 57,600 price dislocations per trading day. I have built a deterministic trading strategy that incorporates a quantitative excel spreadsheet “real-time” data input, calibrated to a set of parameters that eliminate the “noise” while showing the directional price formation of the underlying asset correlated to the options premium. The most telling function is the price shifts and comparative profit between simulated Call/Put profits during intraday trading that are depicted on the GRTS Tactical Trader. I currently use TD Ameritrade, Thinkorswim, Dough, and Capital One Sharebuilder. The reason is for the very reason I mentioned at the beginning of this article: tracking price dislocations, i.e. “flash trading” by HFTs that cause “virtual price dislocations” giving them a profitable edge on my trade executions, while I take a greater loss. ** For TOS traders, the GRTS Tactical Trader is currently available in the Apache Open Source Excel format, for a token donation. Inquiries via email are welcomed for further information and explanation. This is for advanced users of excel and day traders.